From the moment I saw one, I fell in love with the idea of owning my own project table. I spent a lot of time searching for one online that I could afford. That never happened. They usually range in price from $399-$600. So, I decided to make my own! I tried to make this project as simple as possible, but still structurally sound, inexpensive, and eye-catching. I'm going to explain how you can make one, too! It only cost me $185.00 to make my table. Including the storage bins, it was a grand total of $227. Not only that, but you do not need to use a hammer or nails. It may not even cost you this much to make the table, because you may have some of the needed items on hand already, and you may be able to find items at better prices than I did. For instance, I know that you are able to buy the storage bins online for less than I bought them for at Home Depot. Below are pictures of some of the items I used. I bought the Velcro strips for $8.47 in the picture above. I didn't end up using them, though. The desk top is so heavy that I haven't found a reason to fasten it down yet. If the kids were going to be near the desk, I would fasten it. -We had a saw to use, and I imagine most of you do, too, but if not, I believe Home Depot or Lowe's can cut the trim, so that it will fit together correctly. -We also already had the clamps to use, so I am not sure how much these cost. You may even be able to find a way around using them. -Once you have gathered all your materials, you can begin by putting the cube shelves together. -Next, stain your table top and all of the trim pieces with one, two, or even three coats, then seal them using two coats of Tung oil. -Paint the two small wood pieces that will go between the cube shelves with the white paint. -Use Gorilla wood glue to attach the white pieces on the bottom of the table top. You will want to measure and mark before gluing to be sure that they will fit nicely between the two cube shelves. Use clamps to hold the wood in place while it dries. -Place the Velcro strips onto the tops of the cube shelves, and the other matching strips onto the bottom of the desk. This step is optional. I haven't used anything to connect the board to the shelves yet, and it is very set in place by its weight. -If you purchased the storage bins, go ahead and put them into the cubes, then celebrate because you are finished!! Below, you can see a closer look at the trim I decided to use. Here is how my shelves looked while I was finishing the table top. Junky and cluttered! I was so happy to finish the project table. I really love it! There is so much surface area to work on. Maybe I'll be using my sewing machine more. Seriously, this is a dream come true. 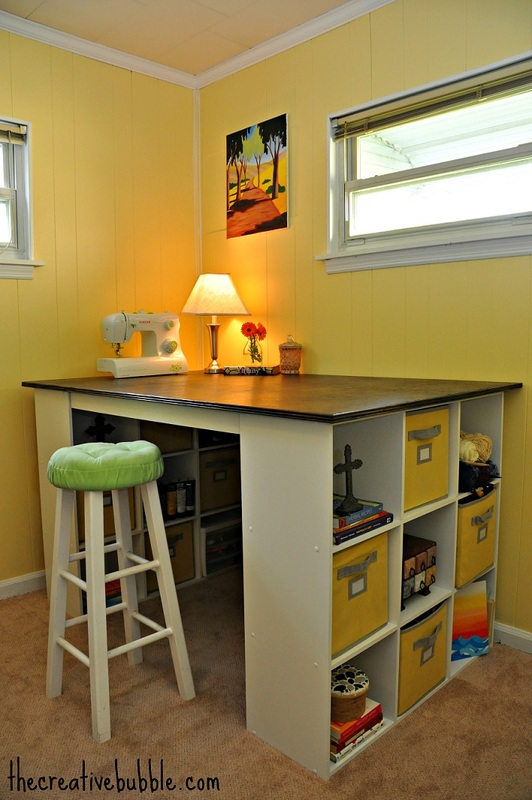 I've always wanted a designated crafting area, and for $227 I now have one :) SO worth it! Hey, do you remember my post welcoming you to our 60's charmer? This is our family's first home before we started updating it. The carpet was replaced and we painted the walls and trim. The left corner is pictured in the "after" picture. For my birthday this year, I have asked my family to hike on over to my house (2 hrs away) to help with some more renovations. I'm so so so so excited. I will be sharing some more before and after pictures of the house once we are finished. I hope you enjoy your homemade project table! If you have any questions about making it, please let me know.